Fire War by T.T. Michael is about Anthony Jackson, a sharpshooter and devoted father. When he proves his loyalty to his nation and President Meyers, he goes from military man to a position on the President's staff. He has a first hand view of an ever-changing world during the mid-21st century. It isn't until his own daughter begins questioning the loss of civil liberties and basic rights that Jackson begins to question his loyalties to the President, who has so skillfully manipulated the public's fear of terrorism for his purposes. T.T. Michael expertly weaves a futuristic tale of a devoted soldier, loving father and loyal American around many of the same issues that Americans struggle with today — including the balance between protecting civil rights with the security and prosperity of the nation. 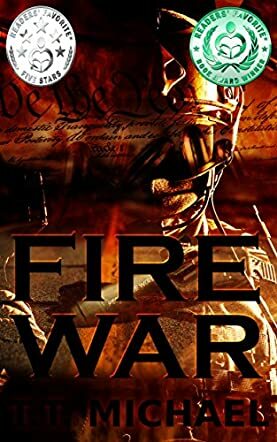 Fire War is a thinking man's dystopian novel written from the perspective of a strong adult male with concerns that most people can relate to. Anthony Jackson, for all his skill and knowledge, is portrayed as the average man doing the best he can with the hand he was dealt. Read Fire War with an open mind to the possibilities and be ready to take a hard look at your present beliefs and how much you would be willing to give up for the promise of a brighter future. This is one dystopian thriller that you'll want to share with family and friends, both for the entertainment value and as a reminder of the Benjamin Franklin quote: "Those who would give up essential Liberty, to purchase a little temporary Safety, deserve neither Liberty nor Safety." July 14, 2051 is the day it all began. A devastating terrorist attack is perpetuated by an until then unknown group called Hariq Jihad (Fire War) where a large number of people are killed at a game at Wrigley Field, Chicago, as well as three other simultaneous and well coordinated attacks across cities in the United States and Canada. As a consequence, the NAU, North American Union, is formed between the two countries. In the year 2076 things are destined to change again, and the life of Gunnery Sergeant Anthony Jackson will become a major part of it. Jackson is ready to retire and is eager to go home and begin life as a loving and caring father to his two daughters. In the blink of an eye the change comes and Jackson is right in the middle at the birth of a nation called the United Continental States of America in which Mexico, Canada and the United States become one nation. Jackson is called to serve UCSA President Meyers, but soon begins to have doubts about the things around him and discovers that many are not exactly what they appear to be, but are they ever? I found Fire War by T.T. Michael to be an interesting, thought provoking tale of what one future could hold. It started a little slowly for me but once the actions started, it picked right up. The characters were interesting and well developed. The reader will get a feeling right from the start that things may just not be what they seem. The dialogue was consistent and well versed. The story was steadily paced and easy to read and understand. Overall, nicely done. Late in the 21st century, the United Continental States of America (UCSA), comprising the former USA, Canada and Mexico, is running smoothly, thanks to President Meyers who also keeps the country safe from the terrorist group Hariq Jihad (‘Fire War’). As President Meyers’ personal security, Gunnery Sergeant Anthony Jackson is a highly trained and skilled Marine devoted to protecting his country, especially his family – his wife Courtney and daughters Maya and MacKenzie. However, he begins to get glimpses of discontent about the current situation. Fire War by T.T. Michael is a futuristic thriller that gives us insight into an intriguing yet terrifying future. The prose is clear cut and, with a solid premise and a tight plot, Michael delves deep into some troubling issues, the ones that we can’t ignore at all. Protagonist Jackson begins to fear for his family when his older daughter Maya begins to question the creeping erosion of personal liberties and the revoking of democratic rights. This is the highlight of the story for me. Comparing Michael’s Fire War with our world today is, to be frank, scary. This is because of the high possibilities of what could happen in the future. As Jackson is forced to rethink his loyalty and beliefs toward the government that he protected most of his life, readers will also ponder on the world political situation today. The line between liberty and safety is indeed difficult to deal with. Overall, Fire War is a great read, an unnerving examination of our world. Fire War by T.T. Michael is my type of novel. First, its protagonist is a sergeant in the United States military. Doesn't matter to me whether we’re talking Marine, Army, or even Navy Seal. I like good, well told, realistic stories about all these guys. Next, Fire War takes place in the future. Around the year 2051 to be more precise, though the story jumps back and forth in time a little. This is the near future, a future some people reading this review will see. When done well, near future stories about the United States are much more interesting to me than tales that take place long, long ago in a galaxy far, far away, though I like those stories too. The bottom line for me is that Fire War takes place in a future very easy to imagine because elements of it are in place today and Gunnery Sergeant Anthony Jackson is someone I can totally relate to because I have been in his boots and done his job. In the world of Fire War, the United States and Canada have become the North American Union. Terrorism is still a threat but wears a new name. Al Qaeda and Isis are old news. The new threat is called Hariq Jihad, or Fire War. Gunnery Sergeant Jackson is the best sniper in the NAU and boy, is his story exciting! Great writing and realistic depictions of the dilemmas many American service members have had to face made Fire War a fast, exciting read. This future seems totally possible, even probable. I really enjoyed this book and this probable future. I can’t wait to read more of it.